(NaturalNews) Increasingly, as the Ebola virus continues to spread and kill, authorities in Africa are becoming more authoritarian in their attempts to contain the deadly disease -- steps that look eerily similar to those imposed on Americans in the days following the 2013 Boston Marathon bombing and which could be imposed again were Ebola to make it to the U.S.
"This will be strictly adhered to without exception," he told Agence France-Presse (AFP) in a telephone interview. "We intend to ensure that the dreaded disease is checked." He also told AFP that several new ambulances and up to 30 military vehicles would be used to help patrol and enforce the movement ban, as well as transport the sick. In addition, AFP reported that a patrol force of 7,000 healthcare workers, civil society activists and members of the local community would be on hand to organize the movement ban, according to a statement from the presidential administration. "Their mission will be to monitor and track contacts, as well as to identify people with Ebola symptoms in order to prevent its transmission," the statement said. "The decision was made to mobilise the entire population from September 18 to prepare for the confinement." Despite the radical tactic, there are already a number of people skeptical that the government's movement ban will work. Members of Doctors Without Borders, a philanthropic group of physicians who lend their talents to economically depressed regions of the world, said in a statement that it "will be extremely difficult for health workers to accurately identify cases through door-to-door screening." Also, the group said, even if suspected cases of Ebola are discovered during the three-day lockdown, the country does not have enough hospital beds for them (though that might not matter much, given the disease's 60 percent mortality rate). "Without a place to take suspected cases -- to screen and treat them -- the approach cannot work," the group said Saturday. "It has been our experience that lockdowns and quarantines do not help control Ebola as they end up driving people underground and jeopardizing the trust between people and health providers. This leads to the concealment of potential cases and ends up spreading the disease further." 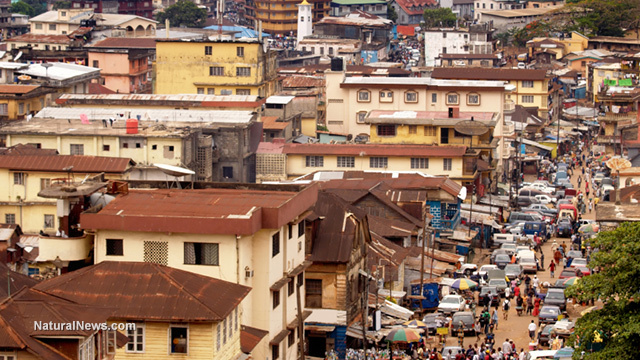 Of the more than 2,000 Ebola deaths, some 400 have occurred in Sierra Leone. Is 'shelter in place' next for America? One doctor told AP recently that the healthcare system in the capital city of Freetown has "crumbled" under the weight of so many cases of Ebola, but also because many residents were fearful of going to hospitals. Also, some doctors have become leery of treating those who show up for care with symptoms of the disease. After the Boston Marathon terrorist attack, residents were told to "shelter in place" by the Boston Police Department and not venture out of doors as authorities searched for suspects. And now, with some experts suggesting in a new study published in PLOS Currents: Outbreaks that there is a 1-in-5 chance that Ebola could reach American shores within the next month, are "shelter in place" quarantines for America next? That study is here: Currents.PLOS.org.